Michael Cohen has accused President Trump of instructing him to lie to Congress about when negotiations ended to build a Trump Tower in Russia, it’s been claimed. 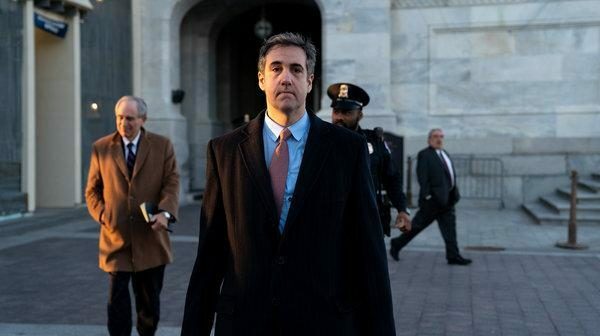 In documents filed late Thursday night, Cohen’s legal team reportedly claim Trump used ‘coded’ language to encourage the disgraced lawyer to lie under oath and say the Moscow tower project had ended by January 31, 2016. Cohen’s attorneys, Lanny Davis and Michael Monico, said the president urged their client ‘during various conversations’ to say there was ‘no collusion, no Russian contacts, nothing about Russia’ after the start of the campaign, according to BuzzFeed. The revelations come in a 12-page memo sent to senior House Democrats in a bid to have his three-year prison sentence reduced. The memo also claims Trump’s attorney called Cohen and congratulated him for lying to the House and Senate Intelligence committees, and said the then-Republican frontrunner was ‘happy with Cohen’s testimony’, according to the news outlet. If true, the memo corroborates a beleaguered BuzzFeed report published in January. BuzzFeed claimed Cohen admitted that Trump explicitly ordered him to lie about the Moscow tower plans ending long before Trump looked like winning the Republican primary. It also claimed special counsel Robert Mueller possessed documentation of it. When the story broke, Democrats called for Trump’s impeachment, and Mueller publicly slammed the report as inaccurate. ‘BuzzFeed’s description of specific statements to the special counsel’s office, and characterization of documents and testimony obtained by this office, regarding Michael Cohen’s congressional testimony are not accurate,’ said Peter Carr, a spokesman for Mueller, less than a day after the story was reported. Speaking to reporters at the White House at the time, Press Secretary Sarah Sanders called the Buzzfeed story’s allegation ‘absolutely ridiculous’ and ‘categorically false’. The new memo is also said to detail a planned trip for Trump to visit Moscow for negotiations in August 2016 – seven months after the president claims correspondence with Russia stopped. ‘In May 2016, Cohen told Trump he could travel to Russia to assist the building of the project either before or after the GOP Convention in August, and Trump agreed,’ Cohen’s attorneys wrote.